Dere Street Homes & Deerness Fencing & Landscaping Ltd (part of Esh Group) stepped in to help by donating all the materials needed and designing and installing the enclosure from scratch after finding out that the raccoons were to be rehomed at the college. 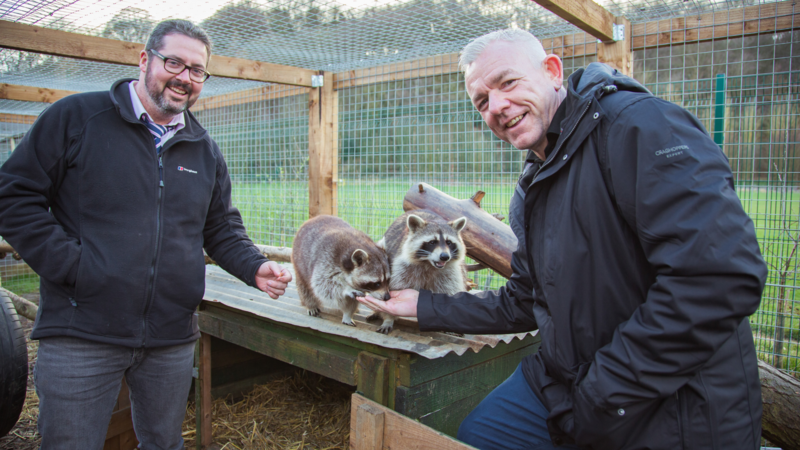 Craig Sproat, Lecturer in Animal Care at East Durham College, was involved in rehoming the raccoons, and liaising with Dere Street Homes & Deerness Fencing & Landscaping Ltd to build the enclosures. Jim Bates, Managing Director of Deerness Fencing and Landscaping was given responsibility for heading up the project. Jim said: “Sean McQuaid, Dere Street Homes Managing Director and I met with Craig on site back in October 2018 and it was clear to us both very early on that not only did the college need the materials to construct a sturdy enclosure, but that they’d benefit from the design assistance that the Deerness Fencing & Landscaping Team could provide as well as providing a team to construct the enclosure in time for the raccoons arrival just before Christmas. Lindsay Haggis, Curriculum Manager of Land-Based Studies, is delighted with the new enclosure. “From all of us at Houghall – and from the racoons! – we’d like to thank the team at Dere Street Homes & Deerness Fencing & Landscaping Ltd for the fantastic new enclosures. East Durham College would like to thank all the staff at Dere Street Homes & Deerness Fencing & Landscaping Ltd for their kind generosity and support in making these new homes for the raccoons a reality.